Cash advances serve a purpose, and can be very helpful to people who need money in a pinch. They are granted when you write a post-dated check and sign a contract to repay. The check you write is deposited by the lender on your next payday. For many, these loans help them get by until the next payday and typically cover emergency expenses, such as an emergency airline ticket, car repairs, or to cover unforeseen bills. In this article, we discuss some of the pros and cons of cash advances, and reiterate their costs and risks. Payday loans are small loans, usually under $1,000, that normally do not require credit checks or exhaustive underwriting requirements. The lender does require an identity confirmation, so you are required to provide your Social Security Number on your loan request. A “soft inquiry” to the credit bureau can allow the lender to verify your identity, but soft inquiries do not harm your credit rating. The lender must protect their assets and consumers, by verifying that applicants are who they say they are. 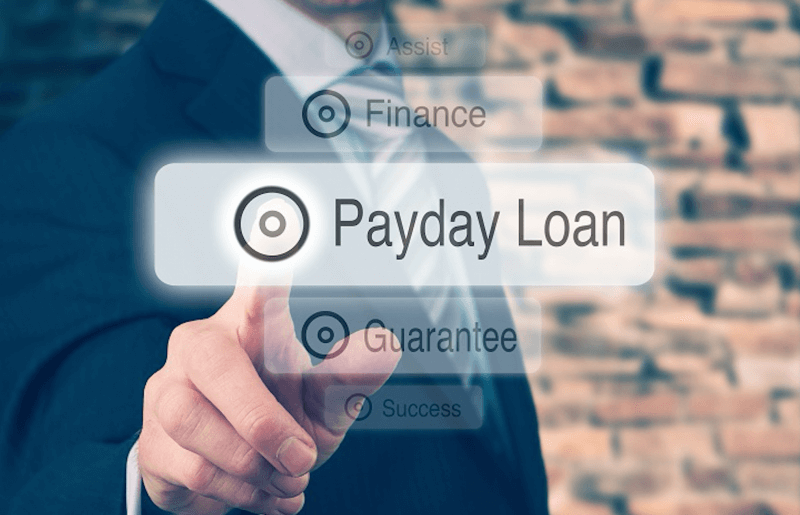 To get a payday loan, the borrower provides a postdated check, or a electronic authorization for automatic withdrawal from the borrower’s bank account. In return, she receives cash, minus the fees. When the repayment date arrives, the lender cashes the borrower’s check, which repays the loan in full. For instance, with a $500 payday loan, a borrower pays a fee of approximately $100, and would therefore get approximately $400 in cash ($500 – $100 = $400). The lender holds the borrower’s check for a short period of time, usually until the borrower’s next payday, or at most a few weeks. At that time, the loan is due and must be paid in full. If the borrower does not have the expected money in her account she may be able to extend the loan. Arrangements to extend must be made in advance and will usually require additional fees. You can apply in person at a physical check-cashing facility or online. Applying in person offers one distinct advantage: you can get your funds right there on the spot. When applying online you can expect your account to be credited within 24 to 48 hours. It’s obvious from the lack of documentation required to underwrite a payday loan that they are significantly easier to obtain than a conventional personal loan, especially for those with credit blemishes, given that your credit score and past credit history are not a factor for approval. Why Is Your Social Security Number Required? Even though a credit check is not performed, don’t be surprised when the lender asks for your Social Security Number. As we stated above, this is necessary to verify your identity, and could be used to report to the credit bureaus in case of a default on your loan. If your repayment check were to bounce or is otherwise invalid, you are charged additional fees and your account may be turned over to a collections agency. So, be mindful of your repayment date as you do not want to accumulate bounced-check fees, overdraft fees, or loan-extension fees. Although payday loans are quite convenient, they are expensive. Their high costs are justified by the risk posed to the lender, and the convenience provided to the consumer. A recent study by the FDIC (November, 2008) showed that payday loans are cheaper than bank overdraft fees, The study stated that “a typical NSF check can result in overdraft fees and interest in excess of 3,500% APR.” The typical payday loan costs an about 300%, so again, they are a matter of convenience if you face an emergency, and need immediate funds and lack sufficient cash in your checking account. If you are at risk of bouncing checks, a payday loan can be cheaper than the costs of overdraft fees. Use this type of Loan Wisely! The best advice we can give, is to use these loans very sparingly. They come with very high fees, and you run the risk of becoming dependent on them. If used too frequently, you may find yourself living paycheck to paycheck. If you default, your loan may be referred to a collection agency and will likely be reported to the credit bureaus. However, some lenders offer flexible payback options, which are convenient, but costly. If you are interested in flexible payback programs, be sure to ask your lender if they offer this service. Be sure to compare the rates and terms at several stores so you make the best choice possible.